Sembikiya got its start in 1834 when a samurai from the village of Sembiki in present day Saitama Prefecture moved to Edo and opened a shop in Nihonbashi selling fruit and greens. Eventually he went on to become the first merchant in Japan to deal in imported fruit. He also undertook hot house production of muskmelons and various other endeavors. Sembikiya moved to its present Nihonbashi location in 1867 and subsequently opened branch stores in Kyobashi and Ginza. With the opening of its restaurant, DE’ METER, and fruit parlor, it was able to introduce various kinds of imported fruit to a wider audience, and to this day Sembikiya continues to offer the choicest fruit from all around the world. 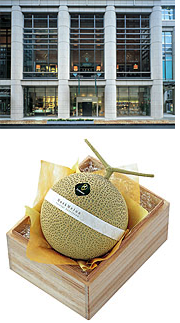 In September 2005 we opened our new main store in Nihonbashi, and here we offer the freshest specially selected fruit in a uniquely scrumptious atmosphere. We hope you will visit our main store soon and join with us as we continue to evolve.